From mildly flavoured stirred products to tangy set ones with added probiotics, Chr. Hansen's comprehensive range of single strain yogurt cultures offers consistently stable and high quality results, whatever style you're making. 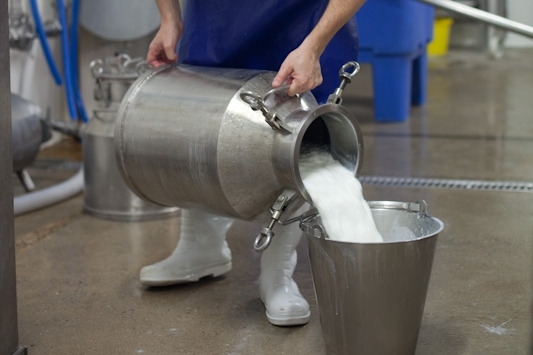 Start with fresh, good quality milk. Heat it to 85°C and hold the temperature for up to 30 minutes (to denatures the proteins). Cool the milk rapidly to 43°C and add your starter culture (check individual culture pack instructions for specific temperatures and hold time). The finished character of your yogurt will be determined by the culture strain you choose, the inoculation temperature (what you lower it to) and the length of time you hold that temperature. In general terms, the longer the hold, the firmer/tangier your finished yogurt will be. For really thick, creamy finishes, either strain the yogurt through a sieve or muslin, or add milk powder to you milk before the initial heating. YC-X11 – Gives a mild flavour with smooth viscosity. Ideal for stirred or drinking yogurts. YC-180 – Gives a medium flavour with medium-thick viscosity. YC-280 – Gives a medium flavour with thick viscosity. YC-370 – Gives a strong/tangy flavour with light viscosity. YC-380 – Gives a strong/tangy flavour with medium-light viscosity. YC-381 – Gives a strong/tangy flavour with medium-thick viscosity. YC-X11 – Gives a mild flavour with smooth viscosity. Ideal for set or stirred yogurts. YF-L811 – Gives a mild flavour with firm viscosity. F-812 – Gives a very mild flavour with medium-firm viscosity. YF-3331 – Gives a medium-strong flavour with medium-thin viscosity. CH-1 Gives a strong tangy flavour with medium-firm viscosity. NOLA-FIT – An innovative enzyme that reduces lactose in yogurt and other fermented milk products, and can even reduce sugar. ABT-1 – Slow fermenting culture giving medium flavour and medium-thick viscosity. Ideal for thick stirred yogurts. ABT-2 – Slow fermenting culture giving medium flavour and medium viscosity. Ideal for medium-thick stirred yogurts. ABT-3 – Fast fermenting culture giving a tangy flavour and light viscosity. Ideal for drinking and stirred yogurt. ABT-4 – Fast fermenting culture giving a tangy flavour and light viscosity. Ideal for drinking and stirred yogurt. ABT-5 – Fast fermenting culture giving a medium-tangy flavour and medium viscosity. Ideal for stirred yogurts. ABT-7 – Fast fermenting culture giving a mild flavour and medium-thick viscosity. Ideal for flavoured stirred yogurts. ABT-10 – Fast fermenting culture giving a mild flavour and thick viscosity. Ideal for low-fat set or stirred yogurts with a creamy texture. ABY-1 – Fast fermenting culture giving a medium flavour and medium-thick viscosity. Ideal for creamy set or stirred yogurts. ABY-2 – Fast fermenting culture giving a medium flavour and medium-thick viscosity. Ideal for creamy set or stirred yogurts. ABY-3 – Fast fermenting culture giving a very mild flavour and medium-thick viscosity. Ideal for thick and creamy set or stirred yogurts. ABY-10 – Fast fermenting culture giving a very mild flavour and medium-thick viscosity. Ideal for thick and creamy set or stirred yogurts. BB-12 – Bifidobacterium animalis subsp. lactis, shown to have potential beneficial effects on gastrointestinal and immune systems. LA-5 – Lactobacillus acidophilus, can be used in conjunction with BB-12 to enhance its potential gastrointestinal benefits. L. CASEI 431 – Lactobacillus paracasei subsp. paracasei, shown to have potential beneficial effects on gastrointestinal and immune systems.